The Federal Reserve, Bank of Canada, Bank of England, the Bank of Japan, the European Central Bank, and Swiss National Bank announced coordinated actions to provide liquidity support to the global financial system. Today’s announcement involves a reduction in cost at which banks in foreign countries can borrow dollars from their central banks. The central banks lowered the price on the existing temporary U.S. dollar liquidity swap line by 50 basis points such that the new rate will be U.S. dollar over night indexed swap (OIS) rate plus 50 bps instead of U.S. dollar OIS rate plus 100 bps. In addition, the Bank of England, the Bank of Japan, the European Central Bank, and the Swiss National Bank will continue to offer three-month tenders until further notice. This arrangement will be effective as of December 5, 2011 and will remain in place until February 1, 2013. The recent escalation of the 3-month Libor is one of the indicators of financial market stress. The 3-month Libor at 0.53% has almost doubled since July 2011 as the European debt crisis has unfolded. 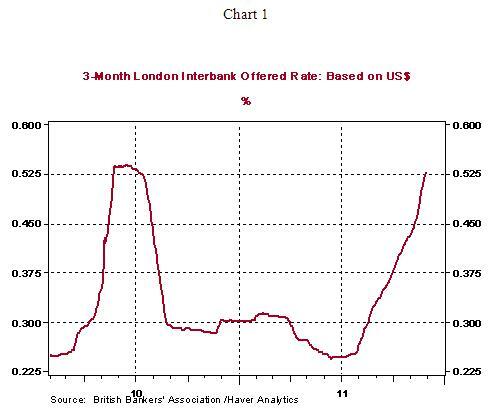 The upward trend of 3-month Libor rates reflects pressure in the interbank market and also translates into higher borrowing costs for all loan products tied to Libor rates. Today’s policy action aims to avoid a severe credit crunch, prevent banks in Europe from selling assets to meet impending capital requirements, provide dollar funding, and avert bottlenecks in international trade due to a lack of dollars. The critical question is if today’s action is an adequate response to resolve the debt crisis in Europe. The short answer is that today’s announcement is a temporary fix not a panacea for the entrenched sovereign debt problems in Europe. The back-and-forth between policy responses and market pressure is set to be repeated in the months ahead until Europe’s banks are recapitalized. In other words, a European TARP is necessary to recapitalize banks, settle markets and enable a crisis-free businesses environment to prevail. Speaking about policy steps, there is flurry of EU official meeting slated between now and December 9. Finance ministers of all members of the EU-27 are meeting today to discuss ways to ensure liquidity for banks in Europe. French President, Nicholas Sarkozy, delivers a speech outlining how to resolve the crisis that is underway on December 1. French President Nicholas Sarkozy and British Prime Minister David Cameron meet on December 2 to reassure Cameron that the ten countries who have not adopted the euro will not be adversely affected by the steps taken to address the euro crisis. Mario Monti, Prime Minister of Italy, will unveil proposals to reduce the deficit and promote economic growth on December 5. Greece’s parliament is expected to approve the austere 2012 budget that is part of the bail-out program on December 7. The ECB holds its policy meeting on December 8. A range of policy steps from lowering the main monetary policy rate to possibly borrowing some from the Fed’s policy response playbook of the 2008-2009 crisis are expected. It is unclear which of these options will be put in place. December 9 marks the end of the two-day EU summit in Brussels and much is anticipated from this event in terms of setting the broken house of the EU in order.